It's been a fairly quiet year for Sheffield's The SSS thus far, but after announcing a string of brand new live appearances plus a new single, the band are back full force and ready to show us exactly why 2017 looks set to be their year. The band is made up of frontman Josh Coddington, guitarists Morgan Somers and Tom Forster, bassist Cal Atherton and drummer Max Smith. I first discovered the band back in the Summer of 2015 when they played Tramlines festival and was immediately blown away by what I heard. Since then, I've seen them live a number of times (including at their sellout headline show at The Leadmill earlier this year) and as time goes on they're becoming noticeably bigger and better than ever before. They have an apt ability to create and perform some of the most compelling, authentic indie rock anthems I've ever heard, and I've come to know them individually as incredibly dedicated and skilled young musicians. How did you first come together as a band and what's the story behind The SSS? Morgan: We all know each other from different stuff. Me, Tom and Max went to school together. Cal, I went to primary school with. Me and Coddi played football together. He (pointing to Josh) was in a band before and me, Tom and Max were in a band and tried to poach him. I think we got him when he was pissed. We just said "Are you coming to practise?" Morgan: He still doesn't want to be here, he's just stuck! Were you all passionate about music from an early age? Morgan: Milburn, Monkeys, Harrisons... That for me was my first interest in music. Max' cousin is a drummer. So yeah, we grew up with it. Coddi doesn't like it though. It's Mamma Mia for Coddi... soundtracks. You've been doing this for quite a few years now; how do you feel the band has grown in that time? Josh: We've got better! When we first started, we were crap. Morgan: You find your feet a bit, you mature with it. You've got to get a bit of a sound for yourself. At one bit we were making songs that were just... Oh my god. One was like Def Leppard... one was Mamma Mia soundtrack... and then we eventually found The SSS. You've still got a couple of festival appearances left for this year- this one (Askern Music Festival), AMP Festival in October, and then I see you're playing the launch party for Kazoopa Festival in November... festival season must be an incredible time of year for a band; do you think there's less pressure playing in a festival environment in comparison to a headline show? Morgan: I think so. Stuff like this you just turn up and play, it's quite nice. 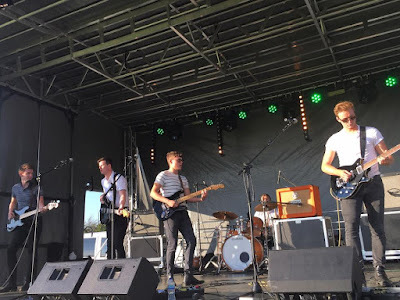 Tramlines was our best gig this year- Milburn came back, and people came just for us. But yeah, there's no pressure- you just turn up! Have any of you attended any festivals this year? Morgan: What an apt question! They keep taking the piss out of me because I went to Glastonbury and never shut up about it. Morgan: Favourite one was Hurts. I was next to Alexa Chung watching them! I'd had my first shower of the festival so I was spick and span. They were getting pictures and me and Tom were trying to get in the background. I was checking her Instagram to see if we'd got on it but sadly not. I have to say when I first heard about Askern Music Festival, I was a little bit shocked... I couldn't help but think it's a bit of an odd place to put on a festival. Where's the weirdest place you've ever played and why? Josh: Woodlands! We played Woodland Rhinos in Doncaster. Jimmy Mac put us on at a gig there. We turned up and as soon as we got there... two blokes were scrapping on the floor. Morgan: We were all in the car just waiting and watching, one of them took his shirt off and everything. They made friends after! 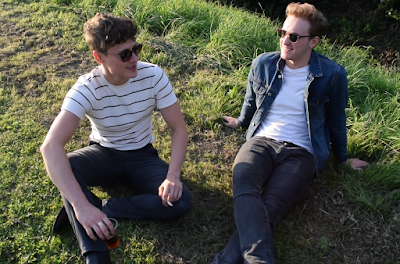 There's a really strong music scene in and around Sheffield at the moment. What other local bands are you into? I'm seeing a lot online at the moment about the Music Venue Trust movement; I read that in the last 10 years we've lost a massive 50% of our live music venues. I know when I first started going to gigs, the Cockpit in Leeds was my favourite venue and that's gone now. It's tragic because the small venues, I'm sure, are invaluable to up and coming bands such as yourselves aren't they? Morgan: It's like Boardwalk in Sheffield, thats where Monkey's first did their gigs. That was a starter for bands and without sounding bad, anyone could get a gig there. You'd get there and start, and be able to say that's how you did it. But now, it's crap. Without small venues, there's no where you can play, there's no building blocks to jump up. Now I know you have a big hometown gig coming up in November (the band play Sheffield City Hall on November 26th). Do you have anything special planned for that? Morgan: We're keeping it under wraps but it's our biggest one so we've got some ideas. To play City Hall, we've got to rise to the occasion! When you asked earlier how we've changed, we do try to make it more of a show. When it's our own gig we've got free roam. So yes we have is the answer, but we're not gonna tell you! There seems to be a lot of mystery surrounding your forthcoming single- what with the cryptic posts on social media and what not. What can you tell us about the new music at the moment? Josh: The new single is called 'The One You Need'. Morgan: We've posted "T", "O", "Y", "N" but on Instagram it's backwards so I had a text from a friend asking "Does that mean you're playing Y Not Festival next year?" Finally- what do you have in the pipeline for 2017? Josh: I think we're just gonna see how the rest of 2016 goes first. Morgan: We've got a run of gigs in October and November. Then there's the release in November so for now we're focusing on 2016 but we'll see what the future brings! You can buy tickets to see The SSS at Sheffield City Hall here.